MainAll NewsMiddle EastIs this the plan that will remove Iran from Syria? Is this the plan that will remove Iran from Syria? Trump administration reportedly developing new strategy for Syria that would focus more on pushing out Iran and its proxies. The Trump administration is developing a new strategy for the war in Syria that would focus more heavily on pushing Iran's military and its proxy forces out of the country, NBC News reported on Tuesday, citing five people familiar with the plan. 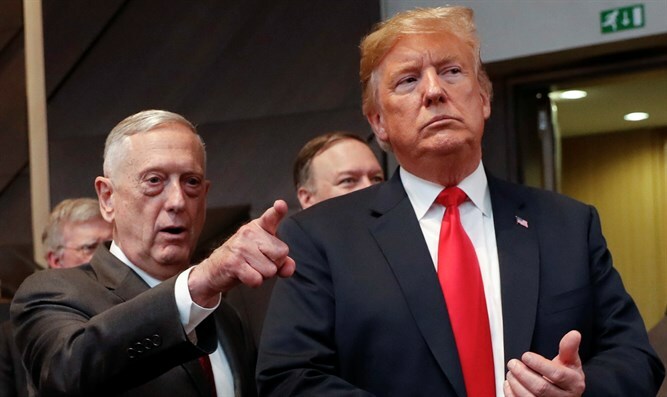 The new strategy would not involve the US military directly targeting and killing Iranian soldiers or Iran's proxies, however, since that would violate the current US authorization for using force in Syria. The US military does have the right of self-defense under the authorization, and could strike the Iranian military if it felt threatened. The plan would emphasize political and diplomatic efforts to force Iran out of Syria by squeezing it financially, according to NBC News. It would withhold reconstruction aid from areas where Iranian and Russian forces are present, according to three people familiar with the plan. The US would also impose sanctions on Russian and Iranian companies working on reconstruction in Syria. "There's a real opportunity for the US and its allies to make the Iranian regime pay for its continued occupation of Syria," said Mark Dubowitz, chief executive at the Foundation for Defense of Democracies, a think tank strongly opposed to the Iranian regime. Driving Iran out of Syria would be one prong in an approach that would also involve continuing to destroy remaining pockets of Islamic State (ISIS) fighters and finding a political transition after the exit of both ISIS and Iran that does not call for Syrian President Bashar Al-Assad to step aside. US defense officials worry the increased focus on Iran and the presence of both militaries in Syria could pull the US military closer into conflict. The US is not allowed to specifically expand the US military mission in Syria to directly target Iranian assets, according to legal experts, because that would put the US on the wrong side of the Authorization for Use of Military Force (AUMF) passed by Congress in 2001. That authorization, which permitted the use of military force against ISIS in Syria, limits US action to targeting groups responsible for the September 11, 2001, attacks and their associates. Israel has expressed concern over Iran's growing influence in Syria, while the US has been pressing for Iran to withdraw its fighters from Syria. A US official recently indicated that Trump and Putin agreed in principle during their July summit in Helsinki that Iran should exit Syria. In April, Trump said he wanted to get US troops out of Syria, but both US officials and international allies persuaded Trump to keep US troops in Syria by convincing him that leaving was counter to his efforts to get tough on Iran. The president's cabinet, his military leadership, and allies in the Middle East who opposed US withdrawal persuaded him that a US departure would create a vacuum that would be filled by Iran and ISIS. That got Trump's attention, according to the five people familiar with the new plan. While the new Syria strategy does not include a mandate that Assad must go, it states that the new government cannot have close ties to Iran and must be willing to prosecute individuals who have committed crimes against humanity, the sources told NBC News.